The Cake Story – Food. Boom. All about me, all about food. It’s the best kind of story!!!!!! And it begins with myself and the boy, wandering past a small cakery at least once every Saturday whilst about our business in sunny Colchester. With each passing we at least slowed down, if not all together stopped to admire the edible artworks in the window. We didn’t go in, as it is small and that end of town is populated with many independent cake and coffee establishments which have previously won favour. I must admit that my preference for other venues was more than a little biased by my ever expanding experience of beautiful looking cakes tasting like mildly sweetened cardboard. I love cake. If I was prepared to buy much bigger trousers, I would have cake every day. I like pretty things too, but pretty cakes tend to be so disappointingly bland, often a few days old and past their best underneath that finely crafted sheet of rolled sugar surround. Not that I wish to frown upon the immense work, precision and craft it takes to decorate a cake properly. I can’t do it, and I admit it freely. I can whip up a grumpy looking cake that’s wonky on top with a dull finish that tastes like a baked slice of heaven however, and I will always vote for function rather than form in these stakes. Fables the world over tell us that an attractive exterior is worthless if there’s nothing good on the inside afterall. There is nothing more disappointing than shelling out on a glittery, over coiffured cupcake that degenerates into a glittery pink mist of air brushed polystyrene once it hits the taste buds. Heart breaking. So, we looked in the window in The Cake Story many times, then walked on by. Only one day, we didn’t. Whilst looking in the window a painfully stereotypical brash Essex granny was loudly complaining at the price of some gorgeously presented macaroons on display. At about 60p each, the proprietors were apparently ‘avin a larrrrf’. I have no idea of the relative cost of a macaroon, but upon looking at the little sandwich board in the street it appeared that you could purchase one slice of cake and one hot caffeinated beverage inside for less than four quid on that particular day. This seemed entirely reasonable and not at all comedic to me. 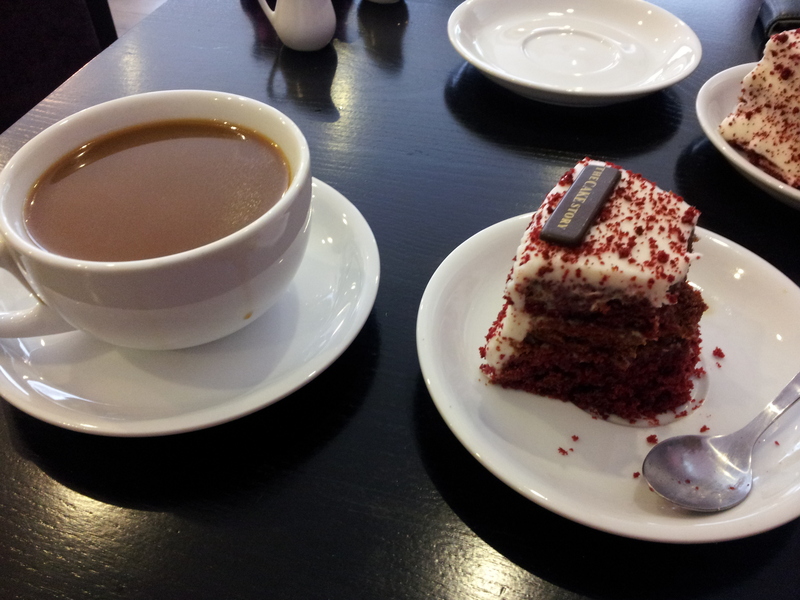 A brief discussion ensued, based largely around how amazing the red velvet cake in the window looked, and in we went for some refreshments before hitting Sainsburys. 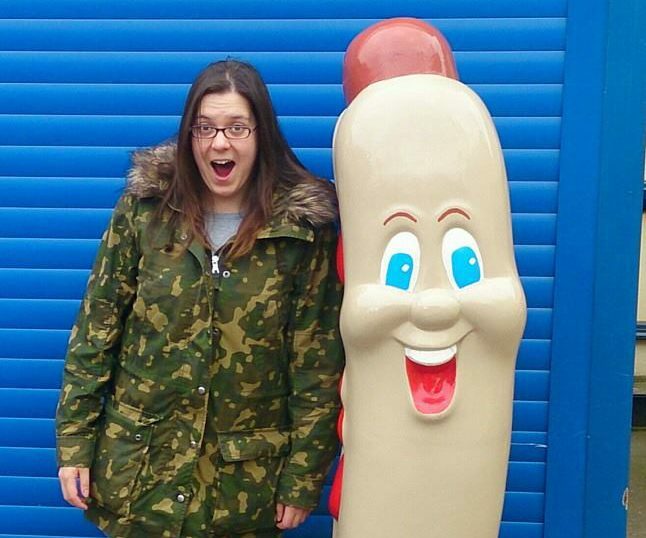 You should never go shopping when you’re hungry you know. Coffee & Cake. A welcome luxury on a cold Saturday afternoon. I should at this point state that The Cake Story is in the business of selling fabulous celebration cakes for you to take away, the small barrista bar and cosy bank of tables in the shop front almost seems like an aside, but one that generates plenty of business I imagine. The staff are spectacularly friendly, doing their best to explain early on that the display cakes are exactly that, displays, before elaborating on what is on offer today before you take a seat. Behind the little bar you can see into the main kitchen and glimpse the magical works that occur therein. Then, you can sit down on a comfy chair for a wonderful and generously cut slice of cake and a more than acceptable coffee. Or if tea is more your chosen cake accompaniment, you wont have to pay for it at all! The red velvet cake was fantastically light and moist, balanced perfectly with a thick, slightly sharp frosting which I suspect involved cream cheese or sour cream perhaps. Sweet and comforting without being heavy or sickly and so beautifully, beautifully decorated it was an absolute bargain. You should be prepared to make friends with other punters however, as it is certainly a shared space experience but with cake that good everyone is happy. Actually just as we were leaving an apparent regular came in, greeted the staff without actually ordering then snuggled herself into a seat to wait, proclaiming joyfully that this was the best spot in town. She may have a considerable point there. 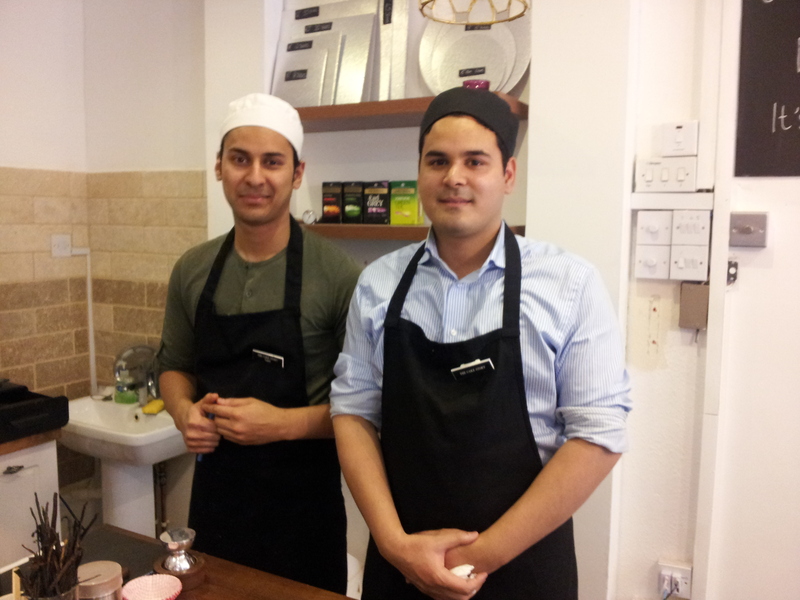 Your friendly neighbourhood cake men. 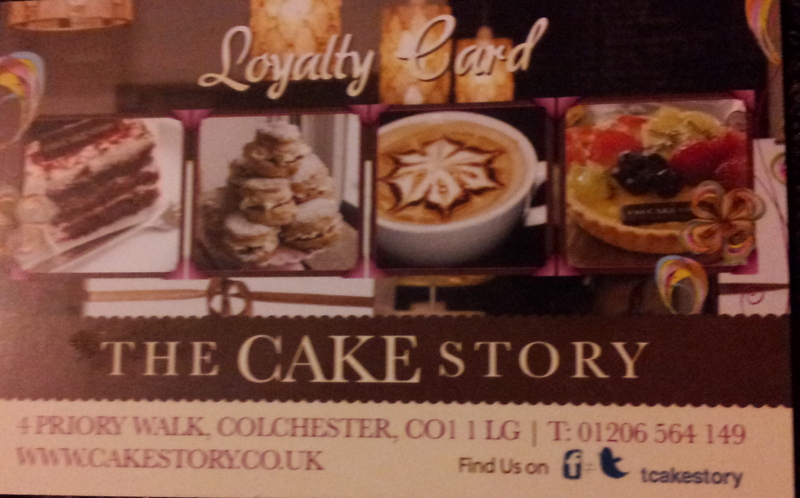 I shall certainly be back to make the most of my loyalty card, and am already racking my brains for a reason to purchase one of their glorious celebration cakes. But having looked at the pricing, do we really need a reason? Their 6″ cakes start from just £11-50 and they really are spectacular, beautifully finished, eye catching and underneath all the bling, yummy. Chocolate cakes, fruit cakes, devils food, a giant cupcake or a VW Camper van cake are all available and shown on their literature. Of course wedding options are available- in fact while we were there a very happy couple were sampling potentials for their big day which looked progressively yummier as they came out. The boy and I briefly considered faking an engagement, but that is another cake story, for another day. They offer a same day service, bespoke requests and use British produce (hurray!) and I shall say again, they are lovely friendly people and I implore you to give them a go if you are able to. If you are an actual person who knows me and therefore probably knows Colchester, head down there and check them out on Priory Walk between Sainsburys and the sports nutrition shop, you wont be disappointed. If not maybe look at their website, if only to gaze a little while at the pretty. Are You Going To Eat That? Enter your email address to follow this blog and receive notifications of new posts by email. We won't send you anything rubbish, promise.